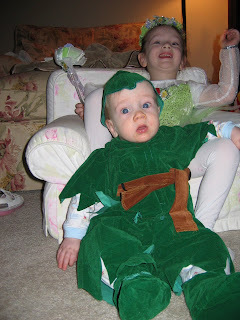 Happy Halloween from Peter Pan and Tinkerbell! We dressed up before heading out to daycare today. Meghan is excited about trick-or-treats and getting CANDY!! 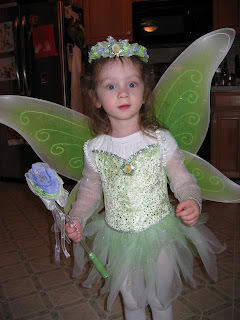 I had Meghan watch Peter Pan this past weekend to help her appreciate her Halloween costume. And, as we were in the car today, Meghan actually said "I can't want to grow up".